« Help buy a satellite to bring cheap Internet to places that don’t have it yet? $150K needed. What can we do about Xmas? Xmas reminds us of what life used to be like prior to the modern era. In the old days it was “Xmas” everyday in one way or another, when people’s lives were ruled by rituals and festivals, and our relatives had to be endured on a constant basis not just once a year. Social pressure was even greater then than now. There was no space for the individual. What you did and how you thought was totally prescribed. By Xmas I mean the in-your-face stuff that fills the public space, physical and electronic. What Christians (or quasi Christians) do in the privacy of their own dining room or in church of course is their business. We will call that Christmas. Oliver Cromwell and the Pilgrim Fathers banned Xmas. We can’t do that, but it would be helpful if some Christians were to denounce the whole thing as a pagan travesty, which it is, of course. George Washington had the right spirit when he crossed the Delaware River and launched a surprise attack on Hessian mercenaries while they were singing Stille Nacht (or doing something equally Xmasy) on December 25 1776. Xmas is not going to go away in a hurry but it would be good to escalate the level of resistance. Here are a few suggestions. OK I know they are lame. Or we could celebrate someone’s birthday, someone who really was born on 25 December. I have noticed a bit of support in cyberspace for celebrating Isaac Newton’s birthday. Gays may instead prefer a Quentin Crisp Day. We could have a little badge to wear that is universally recognized as indicating one’s lack of Xmas spirit. And we could carry something around that makes a silly noise every time someone wishes you a Merry Xmas (or your local equivalent). There would be an international competition to design both. And there could be a smart phone App version of the noise. If you have any suggestions for how to escape or reduce the pain of Xmas add them to the comments. Or maybe you want to say something nice about Xmas. Really, thats Washington crossing the Delaware? Surely not Harry Washington you Know Harry Washington slave of George Washington who ran away during the revolutionary war and enlisted with the British. 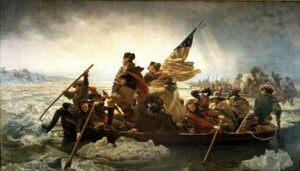 Actaully I always thought that picture was of William Lee (and master) crossing the Delaware and it certainly wasn’t Oney Judge because she didn’t run away until after Washington George not Harry became President. The most elegant change is a return to the much more traditional (by many centuries) Saturnalia, a celebration with pretty much the standard goodwill, gifts, feasts, fun (harmless practical jokes and foolery were encouraged) but lasting for a week 17th to 23, and with one of those days involving a turnabout for masters and slaves – the slaves could (with a little tact) criticise the masters, the masters played waitwes to the slaves who were sitting in the master’s dining couches (although the slaves had probably cooked the meal earlier). Yep, lots of those customs were aquired in around the 4th century Common Era, when xtians started celebrating a nativity, and moved it to december. (For the first few centuries common era, xtians actually frowned on celebration of the nativity). Affecting to be exasperated by a holiday that is hundreds of years old and is celebrated around the world is simple anti-fashion, not even enjoyable curmudgeon-ness.